Thank you both, Wack0 and ISSOtm. I have also checked the Pokémon Trainer's Guide of my UK Gold and Nintendo of Europe back then did not mention the Mail restriction on the manual, only the new Pokémon and moves. Wow! Great discovery! I didn't knew that. The combination Mystery Gift, deliveryguy and Pokémon Center 2F made me almost think like this is a GS Ball Event. Appearently the Officer Sprite was used for the deliveryguy here. As to the Mystery Gift system in the Generation II games, yes, the delivery man uses the same sprite as Officers and it was never used for event items afaik. 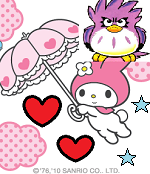 The GS Ball, Mirage Mail, Bluesky Mail, and possibly others were distributed using the Mobile System GB of Japanese Crystal, which is independent of Mystery Gift. In non-Japanese Crystal, the GS Ball event can be triggered by simply assigning a value of 0B to address BE3C while inside the Goldenrod Pokémon Center and then stepping on the ground floor's mat tiles (not all emulators seem to handle this well for some reason so, if it doesn't work, try editing the save file directly). The disassembly refers to a GOLDENRODPOKECENTER1F_LINK_RECEPTIONIST but she is actually the Trade Corner attendant of the PokéCom Center, which has blue hair unlike the Cable Club and PokéCom Club attendants on the second floor, which have green hair. She comes from and returns to the second floor in the localized event (video). That same Pokémon Center does have something to do with Mystery Gift: you need to use the system to receive Eon Mail and then exchange it for a Revive from the female NPC that was added to the localizations and which replaces the male NPC from Gold and Silver that comments on something related to the amount of Pokémon that have been discovered iirc. Thank you very much! I know you guys pretty well too and really appreciate your work. Thanks for the info, most of these things I already knew. Currently I'm doing some Research about Japanese Gen 1 and Gen 2 Events. I try to gather as much information as I can. The Thread can be found right here in case you're interested. I'm keenly interested in what you guys doing and what Hacky did with his Python Scripts is awesome. I was a silent reader for a long time until I decided to register just recently. What I tried to say is that I almost felt like this could have been something like an unused GS Ball Event. But then I had read in the asm that it's about "balls"... plural... I guess it refers to the Balls made by Kurt and has nothing to do with it. It would still be interesting to see it come to action and see how it works. You're welcome! 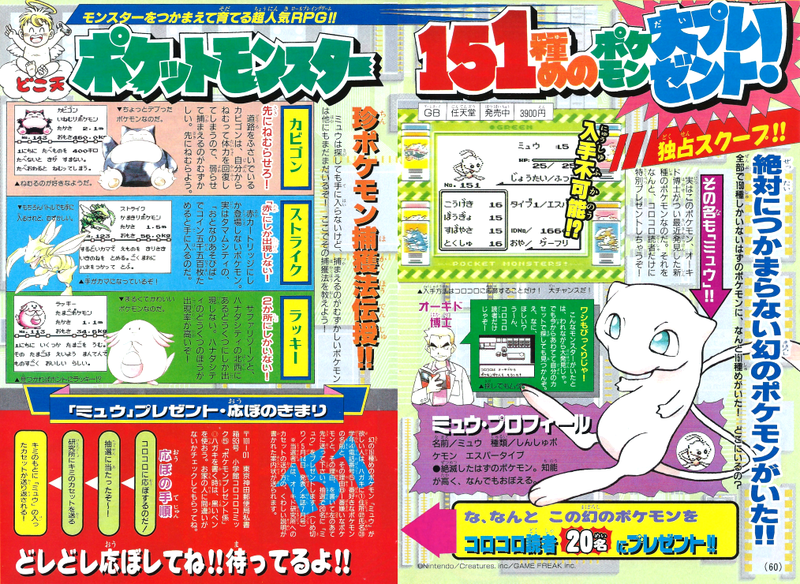 The thread you started about those Japanese events and how Mew had an unusual sprite reminds me of the November 1996 issue of CoroCoro in which multiple Pokémon such as Mewtwo were depicted with sprites that don't match those seen in the actual release of Blue (source, direct image link), suggesting these were early sprites. That June 1997 issue has artwork of Mew I haven't seen before. 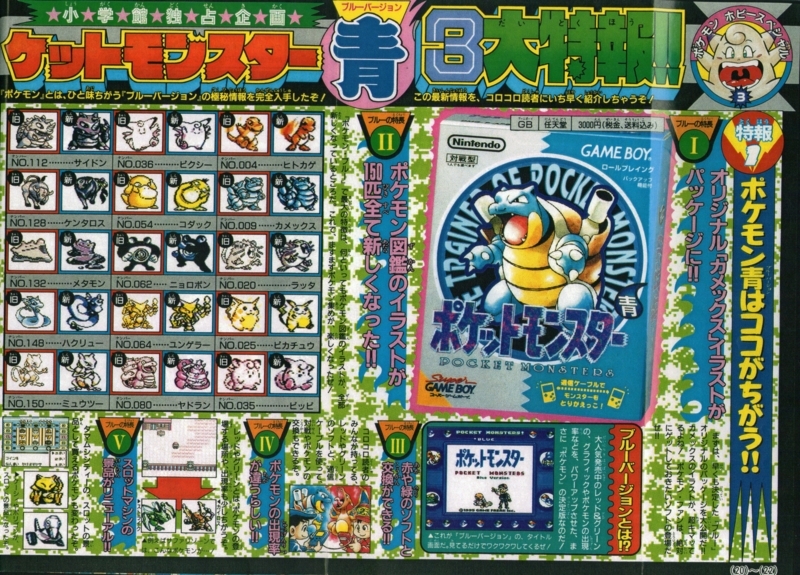 And it looks like Pokémon Yellow was announced in Japan on April 1998 (May 1998 issue of CoroCoro), exactly one month before Red and Blue were announced at E3 1998. I think the Mew software must have been made while they were working on Pocket Monsters Blue. IMO an interesting coincidence that the name of the first Mew Screenshot ever shown has the OT Name ゲーフリ. The same name you can find as default name in Pocket Monsters Blue. Btw. is there any glitch for the Japanese GS versions to get Celebii? So there's only the bad clone glitch? It's been a while since I glitched in GS and C.
So yeah, unless you're able to use a 1G game, you will have to use a Bad Clone. But I think there is another glitch in japanese games using bug contest, no? This one should be the easiest method. The Bug-Catching Contest glitch means you don't have to attempt the cloning glitch wrong (potentially for a long time) for a bad clone. Though wrong TM/HM pocket, glitch Pokédex mode(?) ACE, Hall of Fame SRAM glitch(?) is also an option for Japanese versions of Gold/Silver. I'm unsure if there is a bad move type ACE in the Japanese versions. The function that checks for Gen I compatibility is called SpecialTimeCapsuleCompatibility (https://github.com/pret/pokecrystal/blob/f0209d6ed6a0cd0e759dff49bdfe4d8171229c29/engine/link.asm#L2054-L2133). It's basically composed of three loops which check one part of the compatibility each. The first loop parses species, and this is how it returns : until it encounters a $FF species. The second and third loop instead use the counter counting the number of Pokémon in the party. Thus, only the Pokémon species check is affected by the Johto Guard Trick. Quite a shame, but oh well. As for the Mystery Gift trigger being tied to Kurt, a quick search about the flag turns up that for some reason it's also used by a bunch of other triggers. So I believe something else is going on there, probably that this flag is used as a temporary by different scripts ? - When the delivery guy appears, he sets Kurt's flag again. What if it's a (FF) holding item number (FF)? so I figured Item FF might cancel remaining item check. edit: nvm, I just understood that the remaining loops doesn't actually check the items, but goes by the amount of pokemon in party. Can anyone confirm that Sonic Boom in the Western releases still uses Gust's animation? I think they gave Mew that OT to clarify that it was a special gift from Game Freak (ゲーフリ is short for ゲームフリーク), especially since it was the first distribution of Mew and the first ever in Pokémon. The initial event was held on April 15, 1996, less than two months after Red and Green were released. Were there any pre-announcement rumors about Mew's existence among Japanese fans at that point in time? What do you mean by "so it does" ? Also ACE cannot modify code. That had been brought up before, but it's all the NOPE. Has obtaining a bad clone through save corruption been confirmed? It can if its in the ram. It can if its in the ram. And your using crystal_ real time ace to have the code changed in the ram. So err, I'm not sure it hasn't been said before but both the "Access PC items from the balls pocket" glitch and the subsequent TM Code Execution work in VC games.